Klungkung Palace, officially Puri Agung Semarapura, is a historical building complex situated in Semarapura,klungkung Regency, on Bali, Indonesia. 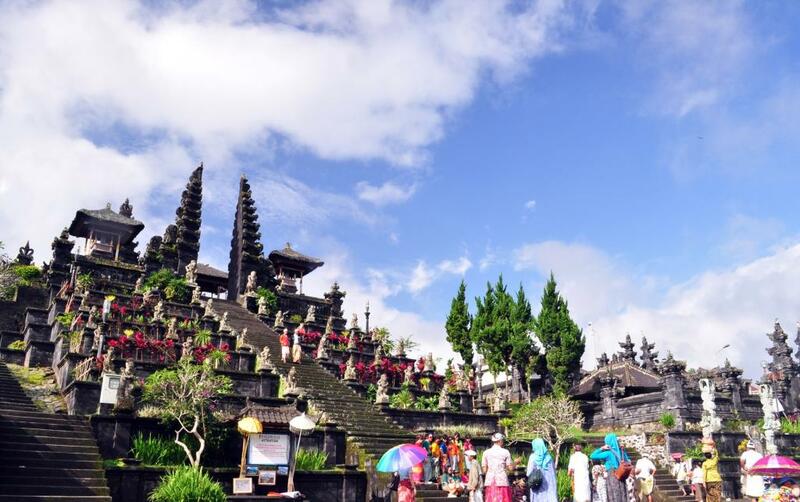 If you want a holiday to east Bali, while looking at historic buildings with Balinese architectural ornaments. Then Kerta Gosa tourist attraction one of the attractions that you must visit. History of Kerta Gosa Tourist attractions, Kerta Gosa was once part of Klungkung royal building complex. Kertha Gosa was built in the late 18th century, and is located at the northeastern end of Klungkung Kingdom. On this day the function of Bale Kertha Gosa is a place of discussion about the security situation, justice and prosperity of the kingdom of Bali, and in the past also functioned as a court in Bali. Attraction & Uniqueness attraction of Kerta Gosa garden is the architecture of buildings that characterize the typical architecture of the 17th century Bali. The beauty of the architecture of the building seen in the building Bale Kambang, which inhabits a pond called Taman Gili. Because there is a pond beral Bale Kambang, then to be able to access the building area Bale Kambang, visitors will pass the bridge from the brick. The uniqueness of the buildings Bale Kambang and Bale Kertha Gosa, is on the roof ceiling of the building. At the roof of the building there is a Wayang painting depicting the case of the trial, and the type to be accepted, if made a mistake. 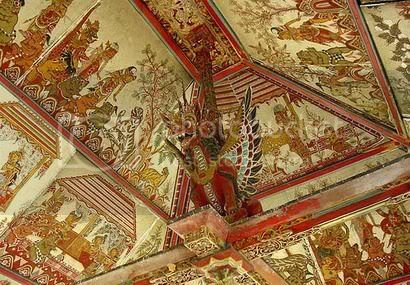 Besides, the Puppet painting also tells the law of Karma Pahala. The law of cause and effect of good man’s bad deed done during life. And Puppet painting also depicts the reincarnation of man to the world to atone for the sins of his deeds (reincarnation). In addition to these two buildings, in the area attractions Kertha Gosa, precisely in the western area, there is a museum that is also crowded with tourists. This museum holds historic objects of Klungkung royal heritage, and objects used by traditional Balinese traditional courts in the past. Bat Cave Temple is located in the southeastern part of Bali Island, is one of the unanswered places while visiting this Island of the Gods. As the name implies, Bat Cave Temple is inhabited by thousands of bats in black gray. Bat Cave Temple, located in the southeastern part of Bali Island, is one of the unanswered places while visiting this Island of the Gods. As the name implies, Bat Cave Temple is inhabited by thousands of bats in black gray. During pre-Hindu times, indigenous peoples believe this cave is connected by a long passage to Cave Temple in Besakih, which is about 35 km away, and they also believe the legendary dragon snake, Naga Basuki, is tuning the aisle. Dragon Basuki is believed to be a stalwart of the balance of the world. In ancient times Bat Cave Temple also used as a testing ground for people who are known to violate the law under the Kingdom of God Maheswara. Bat Cave Temple is used to worship the god Maheswara, who is believed to live in one part of this island. Various ritual ceremonies are held in this temple every day, although most relate to the ritual of death. Bat Cave Temple is located on the edge of the main road, and opposite the clear beach facing the vast sea, still remains an attractive place for tourists visiting Bali, especially for those who are on the way to Besakih Temple. Besakih Temple is a temple complex in the village of Besakih on the slopes of Mount Agung in eastern Bali, Indonesia. It is the most important, the largest and holiest temple of Hindu religion in Bali, and one of a series of Balinese temples. In Bali, many temples and their meaning cannot be separated from the land they are built on, the nature and the spirits and gods they believe do actually live there. The priests let us know that during the 8th century, a Hindu monk had revelations to build homes on this holy ground. They say during the process, apparently many of his followers died due to illness and even accidents. Stories like this are the brickstones of legends so it is difficult to get the historic truth. The people called the area “Basuki”. A name referring to “Naga Besukian”, a dragon deity inhabiting Mount Agung. Besakih was hit a few times by earthquakes (e.g. 1917) and also several volcanic eruptions of Mount Agung took their toll, particularly a major one in 1963. The complex did get damaged here and there but in 1963 the the lava flow did pass sparing the temple from complete destruction. 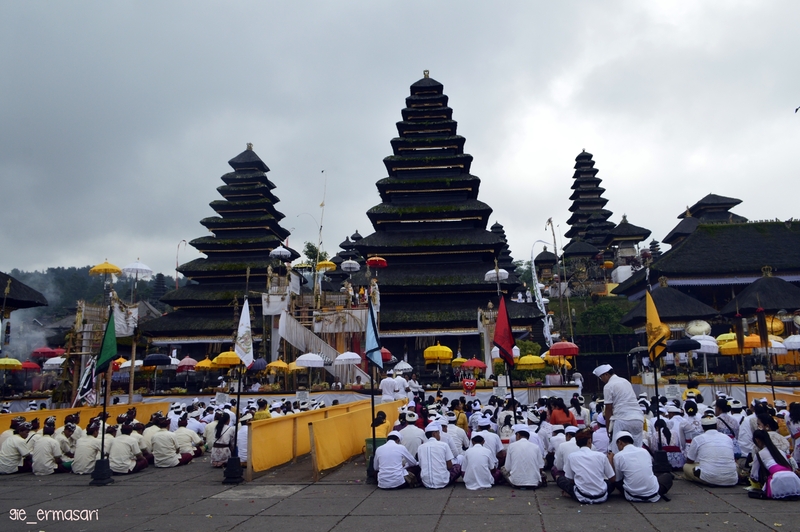 This event is now of course part of the overall legend of Besakih Temple. The people believe that the deities showed their true power but without destroying the holy temple completely. Besakih being the biggest and holiest of the island’s temples plays a significant role not only for the villages and families nearby but for entire Bali. Many important festivals are celebrated here. It is a temple open to every devotee – from any caste groups. It is simply the prime spiritual center for all Balinese. EXCLUDE: Parking Fees, Entrance Tickets and Meals.